Ever since I introduced this Wu Pao-Chun's Champion Toast recipe in my blog, many friends, cyber friends, FB fans and my blog readers have tried it and gave thumbs up for this simple and straight forward bread recipe. We love the soft and fluffy bread texture which this recipe yields. Besides making loaf bread, you can also make small buns with or without fillings. I have modified this recipe, added wholemeal flour to it to make it more wholesome. Here's sharing with you the wholemeal curry potato buns which I made yesterday. I ate it for breakfast this morning and the bun texture still remain as soft as it had just came out from the oven! Simply love it! *You can adjust the curry powder and seasoning according to your liking as some prefer spicier or saltier than others. 1. Saute the onion and garlic in a wok heated with oil. 2. Add in the curry paste and fry till fragrance. 3. Add in the chicken and potatoes, mix well. 4. Add in enough water to cover the chicken and potatoes, let it boil before lowering heat to simmer till potatoes are soft. 5. Off fire and set aside to cool. ** If you do not own a breadmaker, you can either hand knead or use a stand mixer to knead till window pane stage。Proof for one hour or more till double in size. *This extra step will help to improve the texture of breadmaker bread. 4. At the end of program '8', take the dough out of the pan, punch it down, divide into 10 portions of about 50g each, roll into round balls and rest for 10 mins. 5. Use a pastry rolling pin to roll each ball into a disc, spoon fillings in the middle, wrap and seal. Put in bread casing and let it proof for another 50 minutes. 6. Brush the surface lightly with egg glaze (1 egg add 1 tbsp water). 7. Bake in preheated oven at 180 degrees top and bottom heat for about 15 to 20 minutes until golden brown. Brush with melted butter when baked to give a glossy finish. 3rd day- the bun still remain as soft as it was on the first day! Thank you for the wholemeal version. 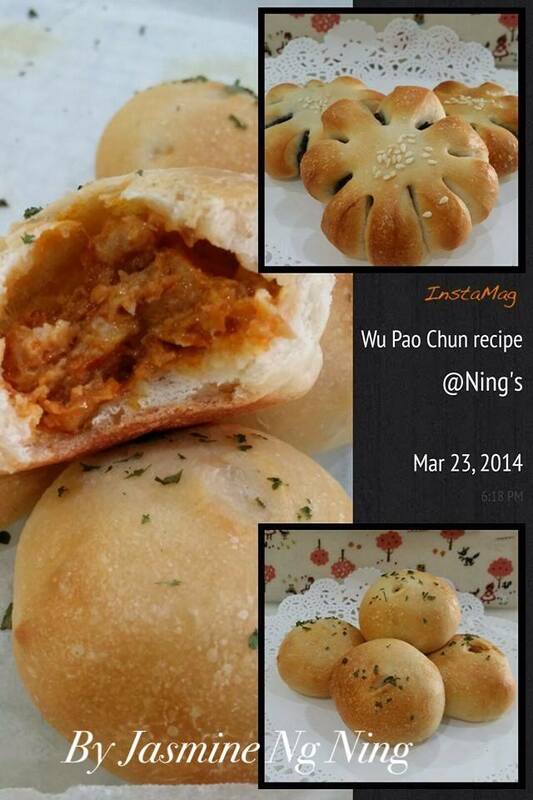 Yes, totally agree with you that Wu Pao Chun Champion bread recipe is really good after I discovered it at Aunty Young's blog. I have never stopped baking using the recipe. Very trusty recipe. My loaf (doubled the amount) lasted 4 days without turning rancid and still soft at room temp. Above all, the little butter and more milk are a catch for a healthier version. No need milk powder, egg, whipping cream, per-fermented dough, etc. and yet taste is top-notch. Thanks for dropping by again, I am really in love with this recipe! Hi Baking Taitai, the curry potato fillings still taste ok on the 3rd day? Hi Jean, I ate the last bun this morning and the curry potato fillings still taste alright. The buns were baked on Wednesday late afteroon, after it has cooled down completely, I stored in an airtight container in room temperature. Wow! Now u r really championing this! Lovely! Hi Baking Tai Tai, thanks so much for the recipe. Its very straight forward and simple. Whats importantly was the bread turn out really soft. First time bake choco chip loaf using BM second time baked sardine and butter bun kneaded by kitchen machine. Both turn out soft and yummy. Ok thanks! I juz made the same buns over the weekend but I gave out most by Sunday! Used the 5k dough and it's really soft! If i am going to use normal machine or hand, i just combine all ingredients and knead till window pane stage and proof for 1 hour. Then wrap my fillings and proof for another 50 mins again? Hi Michelle, I am truly sorry for the late reply as I have missed out your question amidst the hundreds of emails and pm I have received from readers and fans. Yes, knead till window pane stage, proof for 1 hour or till double in size. Then punch down, divide accordingly and rest for 10 minutes before you wrap with fillings and proof for another 40~50 minutes or when double in size. Hi Cheryl. Just tried this recipe today. It was very successful an is delicious but the bottom of the bun sticked to the bread casing and the bottom of the bun is darker than the top. Hi Melinda, it is normal for the bun to stick to the bread casing a little. If the bottom of the bun is darker, you could have placed the tray nearer to the bottom heating element or your oven temp is a little high, you can try to bake at a lower temperature and increase the timing. All temp and timing in my blog recipe are according to baking in my Brandt oven thus you will have to adjust to suit your own oven as different ovens have different thermostat. Hie, i'm new in baking and breadmaker. Using Kenwood BM450. there's no pasta program in bm450. Can i just choose the dough cycle and add everything altogether? Hi Carissa, yoy can skip the pasta program and go straight to the dough cycle, add everything except butter, let the machine knead for a few minutes then it will stop. Add the butter in at this stage. .
Can I just use a total of 300g bread flour instead of 250g bread flour + 50g wholemeal flour? Hi Sharon, yes you can. Some readers have tried using all bread flour and feedback to me that it's good! Hi Cheryl, I have tried using this Hi-Protein Flour to make breads but it always turns out doughy and hard even though I have knead it to window pane stage. I can't seem to get that pull apart and soft texture. Mould starts to grow too after 2 days. Hear from you soon, thanks! Hi Grace, perhaps you might like to switch to Blue Jacket bread flour, it has high water absorbency and can retain moisture well, thus bread or buns bake using it are softer. Sometimes, yeast plays a part too, if your yeast is inactive, the texture of your bread will be dense too. As homemade bread does not use any preservatives, it will turn mouldy after 2-3 days. Remember to cool down your bread/buns completely (about 1-2 hours) before storing it in an air-tight container. It will turn mouldy faster if it is not cool down properly. To get that nice pull apart and really soft fluffy texture, I would like to recommend you my 'Wholemeal Butter Buns' recipe uploaded on the 1 April 2016 in this blog, many readers have tried and feedback that the texture and taste is better than this recipe here. Do give it a try.